Wild-caught Cod topped with melted butter and herbed breadcrumbs. Place in the oven and prepare your taste buds for a trip to New England. 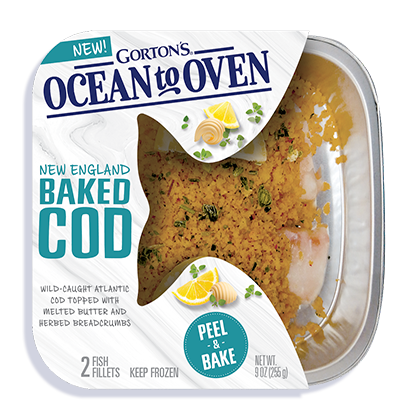 Topped with melted butter and bread crumbs, our New England Baked Cod is prepared in an oven-ready tray so you can bake a traditional meal without the traditional prep. 1. Using pull tab, REMOVE film from tray. 3. Place tray on middle rack of oven and COOK for 29 minutes. 4. CHECK FISH*. If not fully cooked, bake for an additional 2 to 4 minutes. For extra crunch, broil on HIGH for an additional 2 to 3 minutes. *FULLY COOK FISH TO A TEMPERATURE OF 145°F OR HIGHER AT THICKEST PART OF FILLET. INGREDIENTS: Cod, wheat flour, butter (cream, salt), canola oil, lemon, less than 2% of: salt, sugar, yeast, dehydrated onion, nonfat milk, garlic powder, yellow corn flour, spices, parsley, paprika, dehydrated red bell pepper, turmeric extract (color), natural flavor, citric acid. Produced in a facility that processes egg, tree nuts and shellfish.